Case. We started on this project towards the end of December. was prepped and painted. The brake and clutch assemblies were installed. All the new parts and accessories were received. welded the full roll cage together. We worked primarily on the inside of the Jeep this week. The tub and liftgate were prepped, then a bedliner was sprayed in. accessories. Many of the components were sand blasted, etch primed and painted prior to installation. and was brought up to operating temperature. Things are really starting to come together. 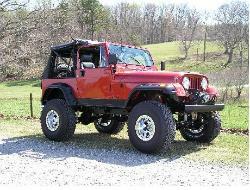 35" BFG AT Tires & Mickey Thompson Classic Lock Wheels were put on. It is really coming together! wipers and wiper motor were installed. A new shifter tunnel cover and knobs were put in place. 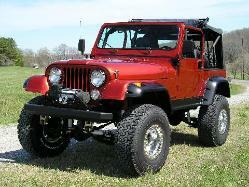 The custom roll cage we built was dropped in and the Warn rock sliders were bolted on. We painted the Jeep a custom orange color & buffed to an ultra gloss shine.